The relationship between the UFC and ESPN has been fairly turbulent since the planet’s premier mixed martial arts promotion inked their blockbuster broadcast deal with FOX this past August. After Sunday’s edition of “Outside the Lines” featuring UFC co-owner Lorenzo Fertitta discussing fighter salaries aired, the battle lines have now officially been drawn. Expecting the story would portray the Ultimate Fighting Championship in a negative light, UFC president Dana White (Pictured) put together his own clip, which includes uncut footage from Fertitta’s interview with ESPN, so fans can grasp a better understanding of the controversy. “I’ve been anticipating this ESPN piece to come out, and it was the piece of trash, one-sided, typical stuff that I knew it would be,” White irritatingly stated. “People don’t realize, ESPN doesn’t care about this sport. ESPN hates this sport. They won’t even cover it. 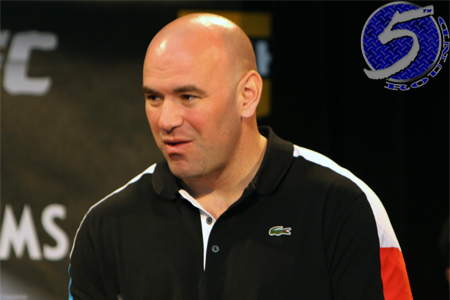 This isn’t the first time White has ripped ‘The worldwide leader in sports.‘ After the network cancelled his in-studio interviews to promote the Octagon’s return to Brazil, White let his feelings be known about how much ESPN despises the UFC, and vice versa. Although he later rescinded his comments because there was an apparent misunderstanding for the cancellations, clearly, where there’s smoke there’s fire. Please go HERE for a recap and video of yesterday’s episode of ‘OTL.’ Click HERE to see Fertitta’s complete and uncut interview with ESPN.